Batkid, better known as 5 year old leukemia survivor, Miles Scott, saved San Francisco from a trio of evil-doers with a little help from his partner in crime, Batman. Parts of San Fran were turned into Gotham City in order to fulfill Miles' wish to be a superhero. Everyone from the Police Chief to the Mayor to thousands of residents turned out to help and witness Miles save the day. 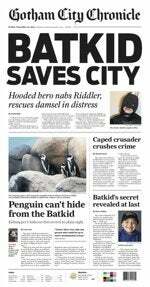 The day included a "high speed" ride through the city in a Lamborghini Batmobile, saving a damsel in distress tied to The Riddler's bomb on the street car tracks, stopping The Riddler from robbing a bank, saving the Giants' mascot from being kidnapped by Penguin, and ended up seeing Miles being rewarded with the key to the city. Absolutely fantastic! Excellent work, Miles...I mean Batkid. You are a true hero. Now if you'll excuse me, I have something in my eye.